In its Global AdView Pulse report, Nielsen found that TV accounted for 62.8% of 2012 global ad spend at $350bn representing a 4.3% year-over-year increase. While ad spend in newspapers and magazines did dip, down 0.2% and 1.6% respectively, the mediums remained key for advertisers to communicate with newspapers coming in second with 19.5% of the share while magazines came third with 8%. 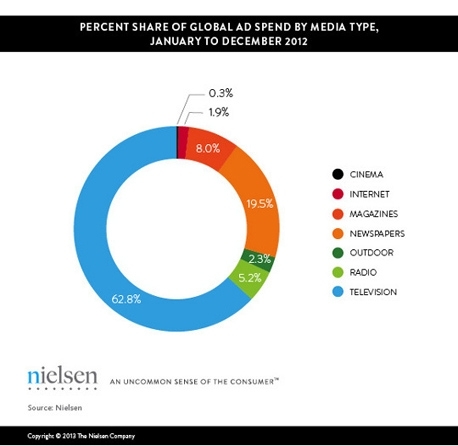 Cinema ad spend continued to climb in 2012 according to Nielsen with the sector spiking at 6.1% for the year. While cinema spending remains relatively small, accounting for just 0.3% of total ad spend in 2012, regions such as Europe with a 7.4% growth and Asia Pacific at 10.3% continued to contribute to the medium’s growing importance among advertisers looking to reach theatre-goers, the ratings company noted. Outdoor ad spend grew by 7.7% to grab 2.3% of total global ad spend in 2012 while radio took a 5.2% share of total spend following a 6.1% rise last year. Another report released today by Nielsen company Vizu and the CMO Council found that advertisers are changing their view on the internet with a shift to branding purposes rather than direct response. Sixty-three percent of marketers though spending allocations to online brand advertising would grow in 2013 with one-in-five thinking it would exceed 20%. However, 51% also expected spending on direct response to increase in 2013, although 41% said that their budget would stay the same.